Quila is my red boy who is marked just like his father, Solaris. He came to visit and perhaps find a new home when he was a puppy. As it turns out, he has found his perfect home right here, enjoying life with his father and sister, JJ!!! Quila is named after The Eagles' Billboard Hot 100 hit, which was released in the spring of 1973. 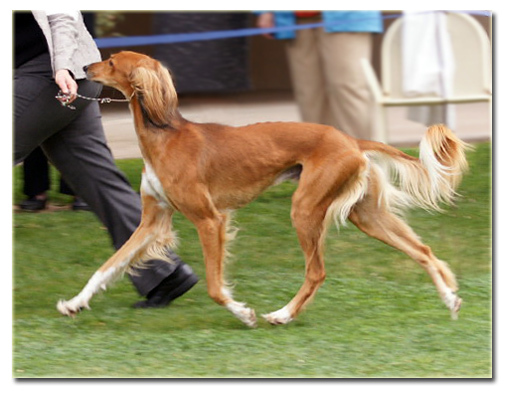 He is pictured above at 15 months of age on his way to Best in Sweepstakes under breeder/judge Ute Ach (Schwanhild) at the Western Hound Association of Southern California show in April 2010. Click HERE to see Quila's pedigree. 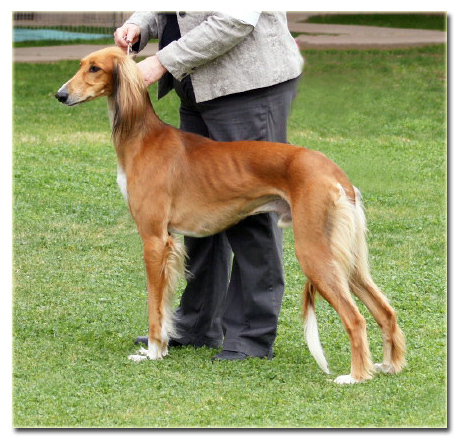 Quila is pictured above in the ring at the Central Arizona Saluki Association Specialty show at 25 months of age. He went on to win Reserve Winners dog this day under breeder/judge Pamela Arwood (Appalachia Salukis)! Quila currently has five points, which include a major and Best of Breed over specials under judge Dorothy MacDonald. 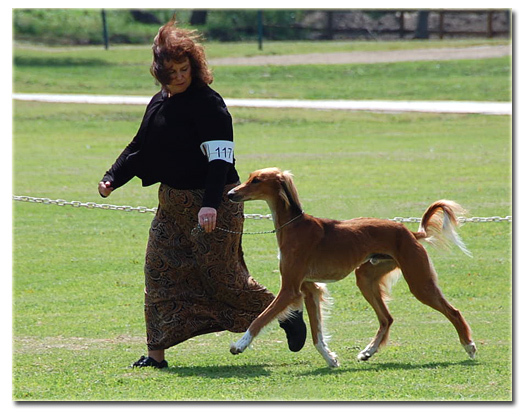 Quila on the move in the ring at the Central Arizona Saluki Association Specialty show in February 2011. He is maturing very nicely. This boy is very keen on hunting, and finding and running down hares is his favorite pastime. He is pointed in NOFCA having only attended a couple of hunts during the 2010/2011 season and he looks forward to fine tuning his coursing techniques! 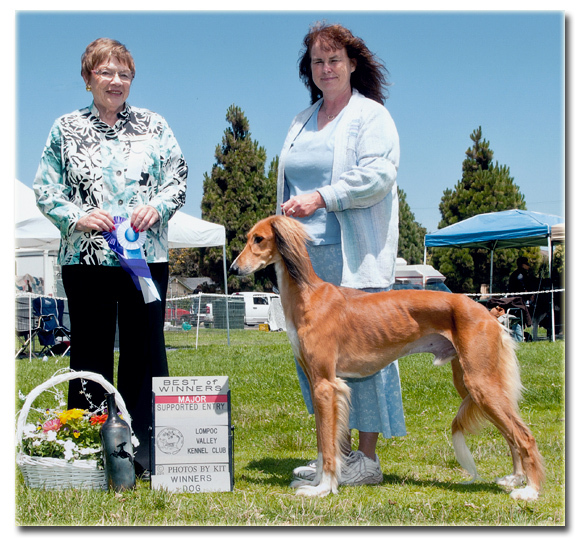 Quila is pictured above winning his second major under judge Audrey Sutton at the Lompoc Valley Kennel Club, San Angeles Saluki Club supported entry in July 2011. He followed this up winning a third major under Karen Dumke and finished his AKC conformation championship on the 5th of May, 2012 under breeder/judge Sharon Kinney (Issibaa Salukis). He is the third champion for the Rock n' Roll litter!